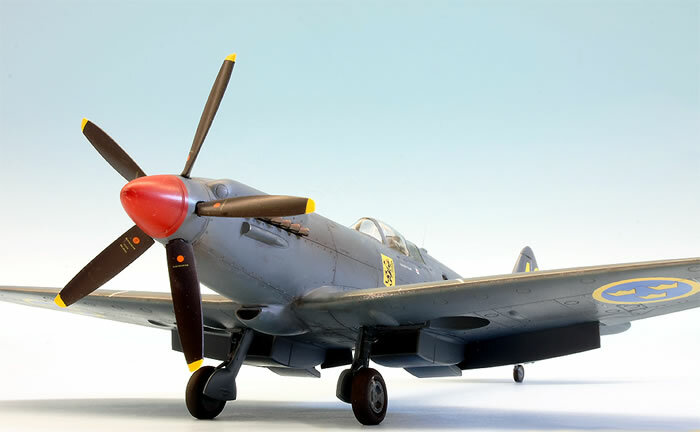 The PR.XIX is one of the last versions of the Spitfire that has been produced in large numbers. The impressive development series of the original design by Reginald Mitchell came to an elegant end with these last variants, in which both the possibilities of the cell and the potential of the propeller-driven piston drive were pushed to the limits of what was possible. 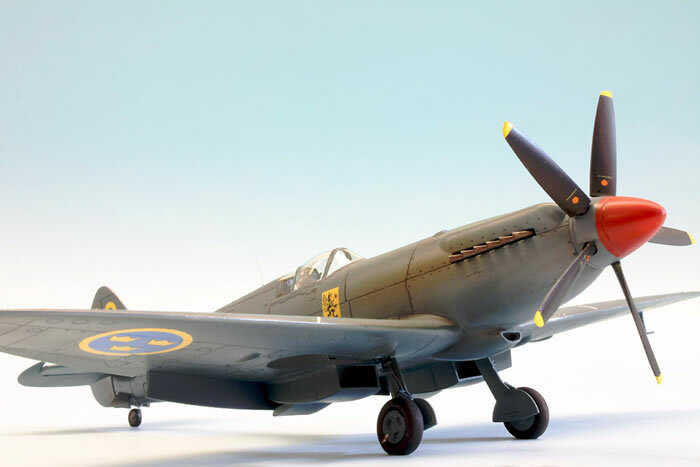 Isn't it remarkable that the Spitfire, whose ancestors were racing airplanes, in the end looks like racing machines again? 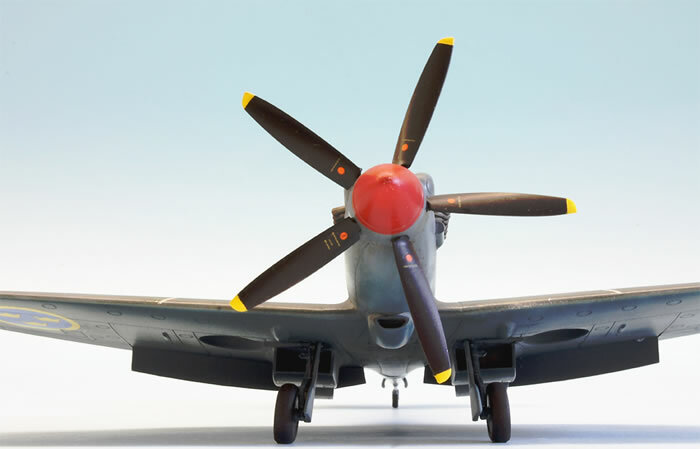 The PR.XIX is characterized by powerful power and a perfectly shaped design, making it certainly one of the most beautiful designs in aviation history. The Griffon engine drove the unarmed reconnaissance aircraft to a top speed of an impressive 715 km/h at a range of 1,620 kilometers. 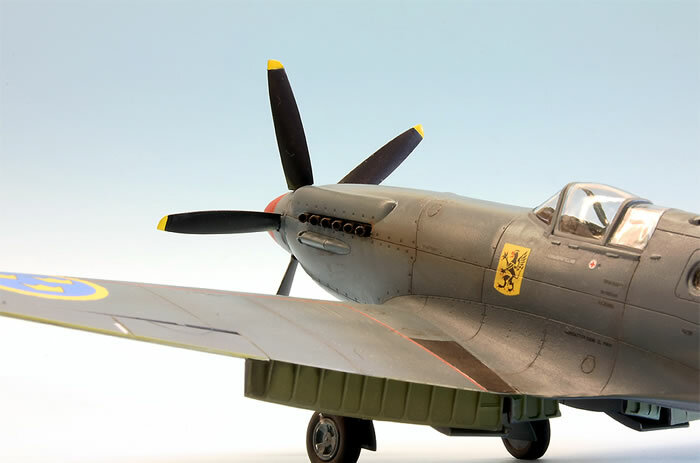 The Royal Air Force took over the first planes in November 1944, with May 46 the delivery stopped. Not only the end of the war but probably the insight that also in the high flying and fast long-range reconnaissance the future would belong to the jet engine, let the production of this high performance airplane end after 225 examples. 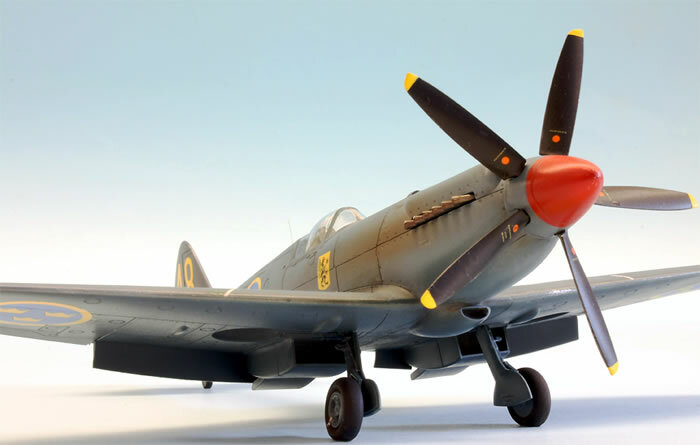 Within the RAF ranks, however, the PR.XIX still flew for more than a decade; the last mission flight of a PR.XIX and thus a RAF Spitfire took place in June 1957. 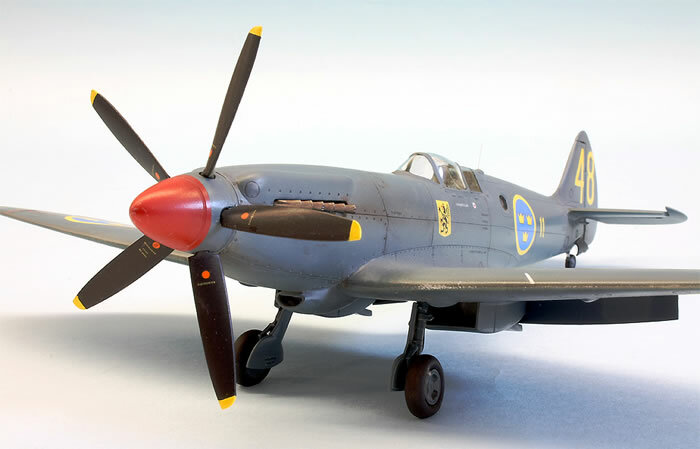 At the end of the 40's Sweden had announced demand for a powerful reconnaissance aircraft. Between 1948 and 49 50 PR.XIX of the RAF were taken over under the designation S.31 and used against the background of the rapidly developing Cold War. 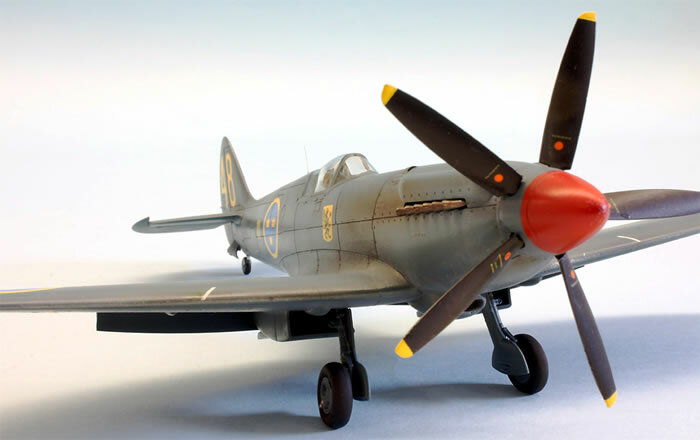 Among the partly secret and sometimes quite delicate missions are reconnaissance flights deep into Soviet territory, for example over the fleet base Murmansk or over reconnaissance targets in the Baltic States or on the Polish coast. 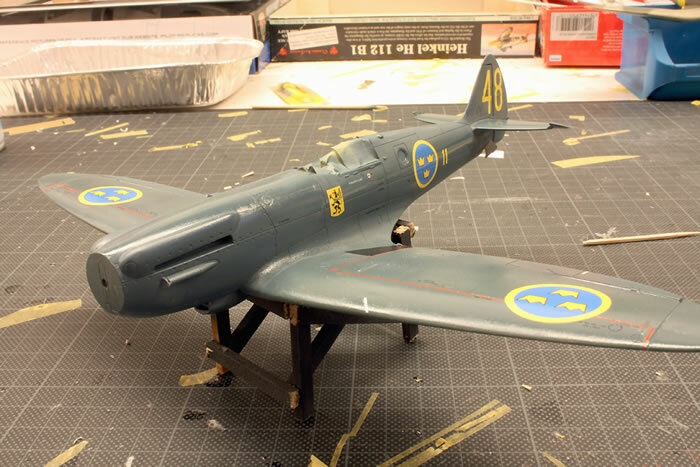 This S.31, 31028, code "Yellow 48" of the squadron F.11, which I built here, is shown in its appearance in summer 1948. By the way, I took the chosen marking from the really excellent decal set of "Moose Republic Decals". 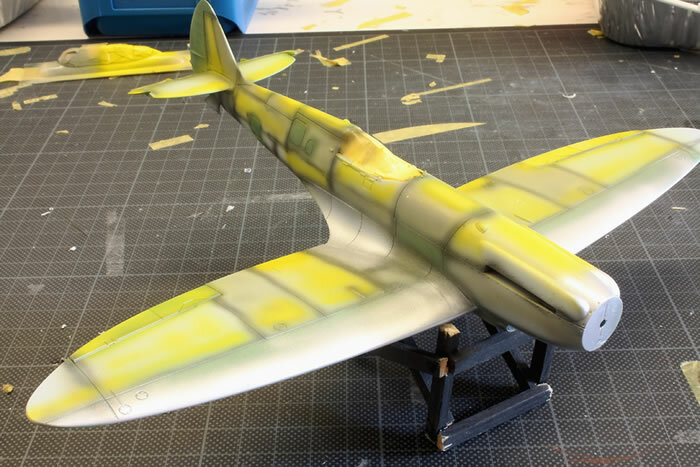 The Airfix kit convinced me right from the start in almost all categories. Above all the fineness and exactness of the parts know to impress. 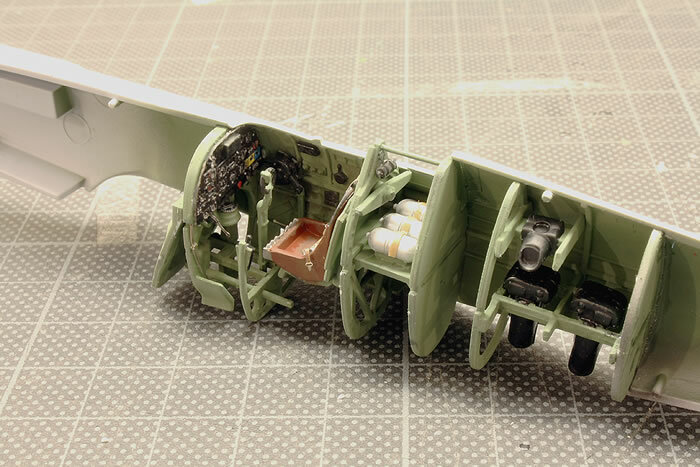 The rear edges of the wings are razor sharp, and the detailed interior in the fuselage segments behind the cockpit is also very pleasing. As a criticism I would like to mention the panel lines, which are too deep; unfortunately even the accumulated layers of paint in the construction process are not able to compensate for this shortcoming. A recommendable extra work, which is absolutely worthwhile and quite easy to do, is the drilling of the 12 exhaust nozzles. Here, however, one can also fall back on the corresponding resin parts of the aftermarket industry. 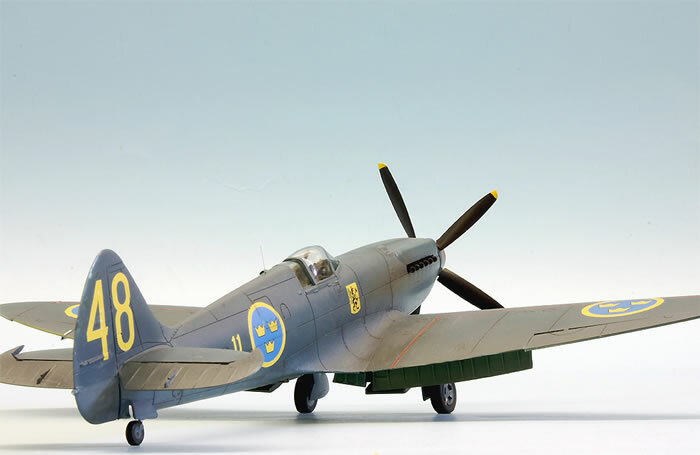 The decals, which Airfix encloses for the British as well as for a Swedish variant, are of good quality and can be processed according to my experiences perfectly. However, "Moose Republik" was chosen because the blue and yellow of the Swedish emblems were too pale. The purchased decal set also offers stencils that belong to the finest I have ever seen. As you can read in the accompanying booklet, even the incorrect spelling of Swedish, which happened when equipping the machines in Great Britain, is reproduced in one of the lettering. 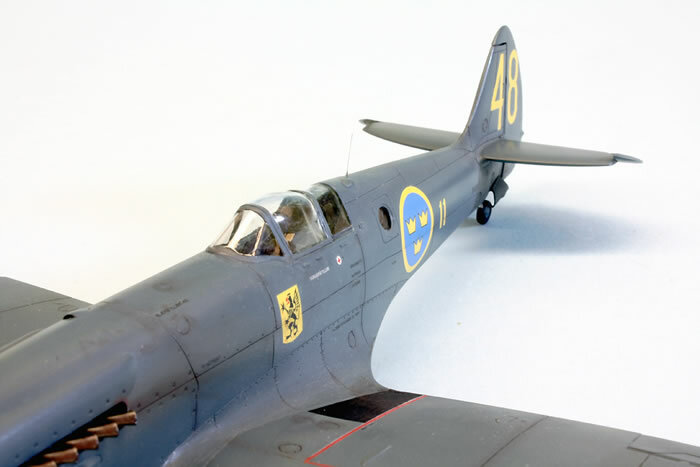 In addition to the markings, an interior set by Eduard was also used; in my opinion, this is a worthwhile purchase simply because of the harness and the instrument panel. 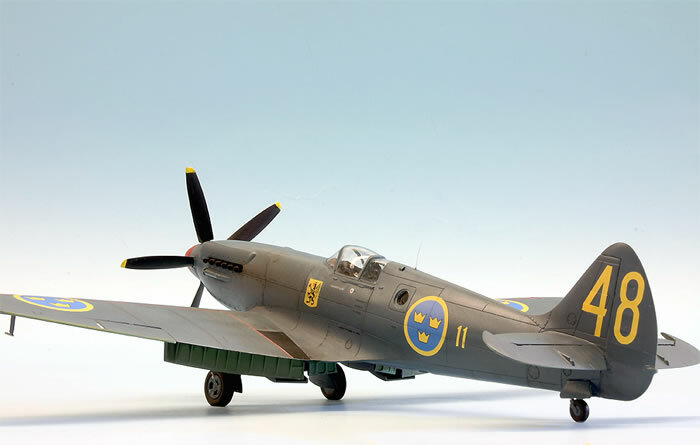 In conclusion I would like to make an unconditional recommendation for this beautifully made and also price-wise quite attractive kit - not only because of the building pleasure but also because of the pleasant circumstance to have a truly beautiful piece of aircraft history in the showcase afterwards!